I've been bouldering in rock climbing gyms for a while and am able to send V2~V3s. I've never bouldered outdoors before and I wonder what are the differences, and are there any outdoor specific techniques that I should focus practicing on? I know the easiest way to find out is just go out and climb but the problem is the closest outdoor bouldering location is 4 hours away from where I live. I am planning on going there to boulder with my friends soon and I want to be as prepared as I could and make the trip count. My friends who could boulder V4~V5 in my gym also told me that they can only boulder at most V2 outdoors. There is no generic answer to your question - it all depends on the kind of boulders you'll encounter on your destination. For example, if you have overhanging jug problems, the technique required is similar to gym problems. But you'll rarely find finger cracks, slabby balance problems or other "outdoor-style" problems in gyms. The only technique that you're guaranteed to need is to be able to "read" the rock and find your routes if they aren't all chalked up (which you can't practice indoors). At first, that might be difficult, but you get used to it. Learn to spot properly. In most gyms, a padded floor means that you don't really need a spotter, but outdoors you'll be thankful for a good spotter. See this question for hints on spotting: How to "spot" someone who is bouldering? Have fun and don't only look at the grades. Outdoor climbing can be quite different from indoor climbing, so go there for the experience, not for the grades! Required techniques vary from area to area and problem to problem, that said I think there are 3 techniques that are universal. This belief stems from my philosophy that the best thing about climbing hard is that there are more cool problems that you can climb. This is not to say there are not cool V2s (or even VBs, but a V5 climber has access to everything that a V4 climber has access to and more. My second belief is that climbers only break out the technique when they lack the power to climb it properly. The first is topping out. Unless you are really lucky, indoor bouldering does not generally require/enable/allow you to top out. You get to the last hold and drop down onto a bunch of cushy pads. Outdoors, you get to the last hold and now you got to figure out how to get over the lip. In generally, involves a mantle of some sort and your feet really high. You blow the top out and it is likely you are coming off head over heels. The second is power. At the V2/V3 grade, there are not many problems that stronger climbers cannot do while wearing approach shoes without jamming, heel hooking or any other technique like trickery. Enough power will get you through almost any V3 (and a lot more). Sure, really good technique applied to the appropriate problem will get you to the top, but if you can only choose one tool for your arsenal, power is not a bad one to choose. The third is enough open hand strength to allow you to deliver your power to the rock. Sure some holds are better crimped and others should be jammed, but again, if you can slap a hold and have your hand stick to it, that should get you through most V3s. As for route finding/reading, at the V2 level, in all but the most isolated areas you will have plenty of access to beta. Even in the absence of beta (and chalk), if you have enough power, it doesn't matter if you miss a key foot hold or your hands are backwards. As for differences in indoor and outdoor grading, this often depends on the area. Indoor bouldering at the V2/V3 level is often on steep terrain with either big jugs far apart or moderate holds close together. Outdoor V2/V3 is often less or near vertical. This means that power that you develop in the gym is less useful outside, but as your indoor power grows and you start to climb steeper problems outside, that gap will close. Bouldering indoors has one big thing that makes it easier than outdoors all the holds are bug brightly coloured plastic. At no point do you have to search around to find that crimp or foot placement, it's all been worked out for you. 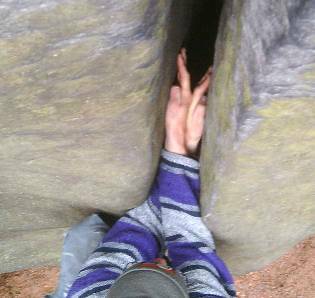 When you boulder outdoors (obviously) there is nothing to tell you where all the holds are. You need to work that out yourself (or get someone to tell you, this is called getting "beta"). Plastic holds feel very similar. Climbing in one indoor wall is typically the same as climbing in any other indoor wall. Rock can very a lot. There is a world of difference between slate and sandstone. So you may climb v2 on sand stone, then go to a slate wall and not be able to do v0 (at least until you get used to it). Indoor climbs tend to be rated lower than outdoor ones. You may well find that if you boulder indoors at v3 you may struggle outdoors at v0. If climbing walls set their v0s at the difficulty of outdoor v0s, they would have a lot less customers. For example I boulder at about v4-5 in my local climbing gym, yet I boulder v0-1 outdoors (I'm not a big boulderer anymore TBF). Not the answer you're looking for? Browse other questions tagged rock-climbing bouldering technique climbing-grades or ask your own question. What features to consider when buying a bouldering slipper?